Fr. 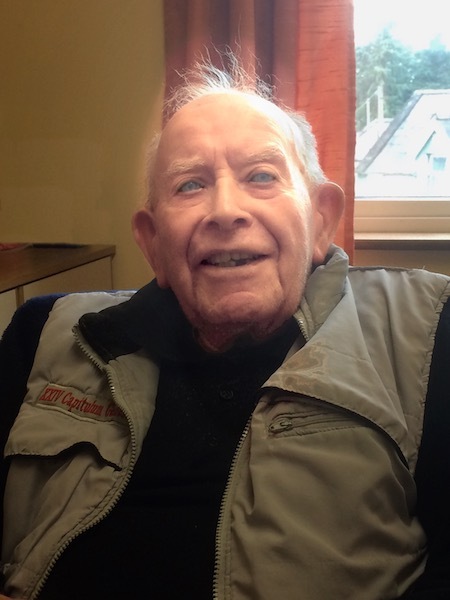 Anthony Mulvey, a Redemptorist for 75 years, on September 8th, 2018. FR. ANTHONY ‘TONY’ MULVEY, C.SS.R. Where were you, and what were you doing on September 8th, 1943? That’s a while ago, now! On that day, Feast of the Birthday of Our Lady, a young man of 21 took his first vows as a Redemptorist, in the Novitiate in Dundalk. His name was Anthony Mulvey. Seventy five years on, this same Fr. Tony is hale and hearty, now aged 96, and residing here in Esker. He came here as a ‘refugee’ from our Dundalk Community about two years ago, when our house there was temporarily closed for restoration. He has put down his roots here and hopes to be here for some time to come! Born in Co. Leitrim in January 1922, young Anthony went to the Redemptorist College in Limerick and completed his studies there in 1942, before going to Dundalk to do his Novitiate year. 75 years ago, this weekend, he became a professed Redemptorist. He did his early studies in Cluain Mhuire in Galway, and then went with some others to Belgium to finish his studies there. Ordained a priest on August 26, 1951 in Galway, he soon after went to teach in the Redemptorist College (now ‘St. Clement’s) in Limerick, where he taught many of the current crop of Redemptorists in Ireland. Leaving the college in 1970 after 17 years of teaching there, he spent a time in Belfast in charge of the Novena to the Mother of Perpetual Help, and then in Dundalk, before going to Luxemburg in 1973 when Ireland joined the then ‘Common Market’. He spent twelve years there, ministering mostly to the English-speaking community, people from various countries. He then returned to work in Belfast (St. Gerard’s Parish) in ’85, before being called to Rome over a year later, in 1987, to work as translator with our General Government there. He spent 23 years there, before returning to Ireland in 2010. He has resided in Dundalk since then, until he came here to Esker about two years ago. At 96, Fr. Tony is the oldest member of the Dublin Province of the Redemptorists. We thank him for all those 75 years of dedicated service to the Lord and his people, as a Redemptorist Missionary. Rath Dé ort, Antóin. Míle Buíochais! P.S. He points out that, if you add his five years in the Redemptorist College as a boarder, and his year of Novitiate in Dundalk, he has spent 81 years with the Redemptorists! And he still loves us, – and prays for us!